Stafford completed 27 of 40 passes for 310 yards, two touchdowns and an interception during Sunday's 28-14 loss to Seattle. He added six yards on one carry and a lost fumble on the ground. Stafford completed 18 of 22 passes for 217 yards and two touchdowns during Sunday's 32-21 win over Miami. He added nine rushing yards on four carries. Stafford completed 14 of 26 passes for 183 yards with two touchdowns and no interceptions in the Lions' 31-23 win over the Packers on Sunday. He also lost a yard on his sole rush. 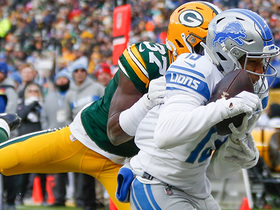 Analysis: It was an unusually muted day through the air for the Lions, who fed two different running backs with double-digit carries for the second time this season. That led to a season-low amount of attempts and passing yardage for Stafford, but he still managed to throw for multiple scores for the fourth consecutive contest. The 10-year veteran now boasts a 10:5 TD:INT through five games and will look to stay hot against the Dolphins in Week 7 following a Week 6 bye. Stafford completed 24 of 30 pass attempts for 307 yards and two touchdowns during Sunday's 26-24 loss to the Cowboys. Stafford completed 27 of 36 passes for 262 yards with two touchdowns and one interception during Sunday's 26-10 victory over the Patriots. He added 10 rushing yards on his lone carry. Stafford completed 34 of 53 passes for 347 yards with three touchdowns and zero interceptions during Sunday's 30-27 loss to the 49ers. He also rushed once for eight yards and lost a fumble. Stafford completed 27 of 46 passes for 286 yards, a touchdown and four interceptions in Monday night's 48-17 loss to the Jets. Stafford completed nine of 18 passes for 113 yards in Friday's preseason game at Tampa Bay. 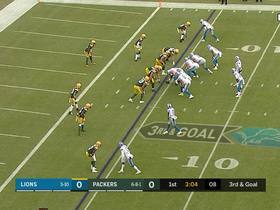 Analysis: Stafford played into the third quarter and set up three field-goal attempts on five drives. He also took three sacks along the way, after taking two in a brief appearance last week. Stafford presumably will be held out of the Lions' preseason finale, thus finishing the exhibition slate having completed 11 of 23 passes for 164 yards without any touchdowns or interceptions. He'll open the regular season with a favorable home matchup against the Jets on Monday Night Football (Sept. 10). Head coach Matt Patricia plans to give Stafford and the rest of the Detroit starters extended playing time in Friday's preseason game against Tampa Bay, Dave Birkett of the Detroit Free Press reports. Analysis: Patricia stopped short of stating exactly how much run he expects to give his first-team offense, but he did say he wants to get his team into "a regular-season mode," which suggests Stafford should get at least a few possessions Friday. 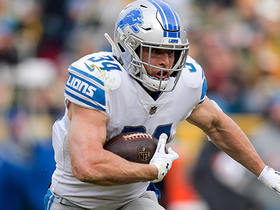 The inability to pinpoint exactly how much Stafford will play obviously renders the quarterback a risky pick in DFS contests, but it could pay off if he stays in the game deep into the second quarter. Stafford completed two of five passes for 51 yards with no touchdowns or interceptions during Friday's preseason game against the Giants. 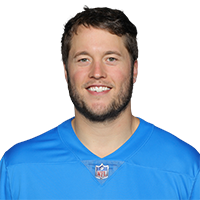 Stafford likely will play in Friday's preseason game against the Giants, Tim Twentyman of the Lions' official website reports. Analysis: Stafford came out in uniform for the Lions' first preseason game but didn't actually play in the contest. He'll likely play at least one or two drives Friday night, though coach Matt Patricia hasn't commented on his plan for the quarterbacks. Stafford is on the Lions' sideline with pads and a helmet before Friday's preseason game against the Raiders, Kyle Meinke of MLive.com reports. Analysis: Stafford wasn't warming up with the Lions' pass catchers, so initial reports favored him sitting this one out. It's still not guaranteed that Stafford will play, but most quarterbacks in his situation would be in street clothes otherwise. Stafford isn't expected to suit up for Friday's preseason game against the Raiders, Tim Twentyman of the Lions' official site reports. 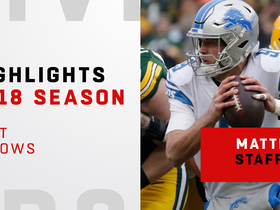 Analysis: There's no reason to risk injury to the Lions' franchise signal caller, so backups Matt Cassel and Jake Rudock will lead the offense in the preseason opener. 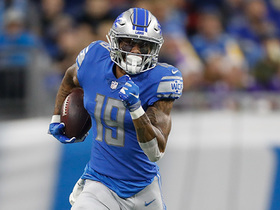 Stafford displayed chemistry with second-year wideout Kenny Golladay during June minicamp, Justin Rogers of The Detroit News reports. Stafford completed 20 of 29 passes for 323 yards and three touchdowns during Sunday's 35-11 victory over Green Bay. He also caught a two-point conversion while rushing twice for two yards. Lions head coach Jim Caldwell said he won't give any consideration for resting Stafford during Sunday's season finale against the Packers, Kyle Meinke of MLive.com reports. Stafford completed 19 of 35 pass attempts for 203 yards, one touchdown and one interception Sunday against the Bengals. He also gained seven yards on his lone carry in the 26-17 loss. Stafford completed 25 of 33 passes for 237 yards and two touchdowns during Saturday's 20-10 victory over the Bears. He also lost a fumble while rushing once for minus-1 yard. Stafford (hand) completed 36 of 44 passes for 381 yards with one touchdown and two interceptions in Sunday's 24-21 win over the Buccaneers. Stafford (hand) is listed as active Sunday at Tampa Bay. 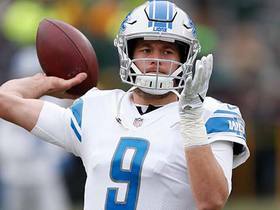 Analysis: As he did throughout the week, Stafford will take the field Sunday with the ring and pinkie fingers taped on his bruised right hand, per Dave Birkett of the Detroit Free Press. Playing through a finger issue last season, Stafford completed 59.5 percent of his passes, averaged 271.3 yards through the air per game, and posted two touchdowns versus three interceptions across four outings. Stafford's throwing hand made daily improvement over the week, and the quarterback is expected to start Sunday against the Buccaneers, per a source, Ian Rapoport of the NFL Network reports. Analysis: Barring any unforeseen setbacks, Stafford will face a Tampa Bay team that ranks 31st in passing defense (267.3 YPG) and 21st in points per game (24.0). Stafford (right hand) is listed as questionable for Sunday's game at Tampa Bay. Stafford was listed as a limited participant during Thursday's practice. Despite being listed as a limited participant, Stafford didn't appear to make any throws at Wednesday's practice, Kyle Meinke of MLive.com reports. Stafford (hand) didn't throw during the portion of Wednesday's practice open to the media, Kyle Meinke of MLive.com reports. Lions head coach Jim Caldwell said Wednesday that Stafford (hand) is "not out of the woods yet" and indicated that the quarterback's injury isn't insignificant, Michael Rothstein of ESPN.com reports. Stafford's right hand isn't broken, but it is very sore and badly bruised, Michael Rothstein of ESPN.com reports. Head coach Jim Caldwell said X-rays came back negative on Stafford's right hand in the aftermath of Sunday's 44-20 loss at Baltimore. 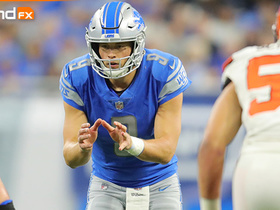 Analysis: Although Stafford doesn't have a fracture, he does have significant bruising on the hand, according to Kyle Meinke of MLive.com. Stafford later told Meinke that he has "burning nerve pain" after his right hand was stepped on in the fourth quarter but expects it to be "OK." The Lions may not report on Stafford's health until the release of the first Week 14 injury report Wednesday, but it remains to be seen if his streak of 108 consecutive starts is in peril. Stafford is questionable to return to Sunday's game at Baltimore due to a right hand injury, Tim Twentyman of the Lions' official site reports. Analysis: Stafford was holding the hand tenderly as he walked to the locker room in the middle of the fourth quarter. If he fails to reenter the contest, he'll finish the day having completed 24 of 29 passes for 292 yards, one touchdown and one interception. Jake Rudock takes over the offense in Stafford's stead. Stafford (ankle) practiced fully Wednesday. Analysis: Stafford came up gimpy in the aftermath of a 43-yard touchdown heave to Marvin Jones during the fourth quarter of the Lions' loss to the Vikings on Thanksgiving. Commenting on his right ankle Monday, he said that he had an X-ray after the game and was "feeling better," which foretold Wednesday's full session. Stafford can now prepare for Sunday's contest in Baltimore, whose defense has allowed just two touchdown passes to quarterbacks over its last five outings. Stafford said his sprained ankle is "feeling better," Dave Birkett of the Detroit Free Press reports. 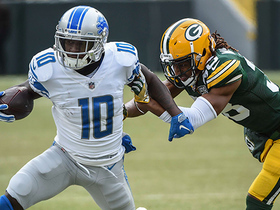 Analysis: Appearing on 760 WJR's The Mitch Albom Show on Monday, Stafford said he received X-rays after Thursday's loss to the Vikings that evidently came back negative. He's now four days removed from first sustaining the injury and still has six days until the Lions kick off against the Ravens this weekend. While the quarterback is seemingly on track to suit up for that game, Wednesday's injury report will be a better indicator of Stafford's potential availability. Stafford said Thursday that his right ankle was "not 100 percent" after he injured it during the Lions' 30-23 loss to the Vikings, Dave Birkett of the Detroit Free Press reports. Stafford completed 20 of 35 passes for 250 yards, two touchdowns and one interception during Thursday's 30-23 loss to the Vikings. He also fumbled twice, losing one of them. Stafford completed 21 of 31 passes for 299 yards and two touchdowns in Sunday's 27-24 win over Chicago. Analysis: Stafford has been quietly impressive this season, with multiple touchdown passes in seven of 10 games. His numbers over Detroit's three-game winning streak have been superb, though. He's posted a seven:one touchdown:interception ratio and an absurd 10.1 yards per attempt. Stafford is humming, but it'll be interesting to see if his luck runs out next week against Minnesota. Stafford was held to 209 passing yards and no touchdowns against the Vikings' stout defense earlier this season. Stafford completed 17 of 26 passes for 249 yards with three touchdowns and one interception while adding 17 yards on four carries in Sunday's 38-24 win over Cleveland. 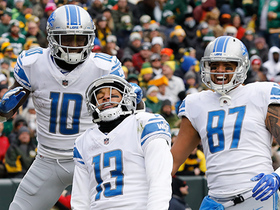 Analysis: Stafford got some help from his teammates early on, as Detroit's two first-half touchdowns came on a running play and a fumble recovery. The league's highest-paid quarterback earned his money late, however, turning a 24-17 deficit into a 38-24 win with three touchdown passes in the final 16 minutes. Those scores of eight, 29 and 40 yards raised Stafford's TD:INT ratio to 17:5 on the season. Stafford completed 26 of 33 passes for 361 yards and two touchdowns in Monday night's 30-17 win over the Packers. 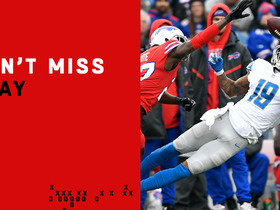 Analysis: Stafford finished Detroit's first drive with a 25-yard touchdown pass to Marvin Jones and never looked back, leading an offense that did not punt the ball Monday. Along with tossing another score to Jones during the fourth quarter, Stafford posted his third straight game with at least 300 yards through the air. Fresh off the momentum provided by Monday's win, Stafford will now look forward to a tasty home matchup against the lowly Browns in Week 10.